“Minute Musings” are simply thoughts we happen to have at any given moment, what we’re smoking….or who knows? This is where we dump our random musings or whatever questions for which we’d like answers. They provide a good opportunity to generate some conversation between Half Ashed episodes. So, drop a comment and let us know what you think! I’ve been vocal on Half Ashed that I believe he’s doing all the right things to get TLJ into a position of prominence within the industry. He’s laid a groundwork of producing a quality product and controlled the growth of his brand so as not to outpace his capacity. The quality control is on par, his leaf inventory is solid and sustainable for controlled growth, the blends are well thought-out, and he has assembled a good team with which to work. I had the opportunity to look over some of the currently-under-development packaging and cigars. I’ll withhold pictures of the packaging pending revision. While there, we smoked the reblended TLJ Reserva and Legend Reserve. I also came back with a Connecticut version of the recently released Counsellor as well. Here’s the quick 40,000-ft overview of some upcoming projects…. The TLJ Reserva Sumatra comes with a Sumatran wrapper over all Dominican binder and filler. I found it to be very clean on the palate, with a prominent cedar component and a slight sweetness that intermittently came into play throughout. The ’63 is being dropped from the name, and the blend for the line has been tweaked. It has a San Andres wrapper over Dominican binder and filler. This may actually be my new favorite cigar from his range. It provided a flavor profile that was quite dark and sweet, with some raisin and date flavors that were astoundingly good for my tastes. 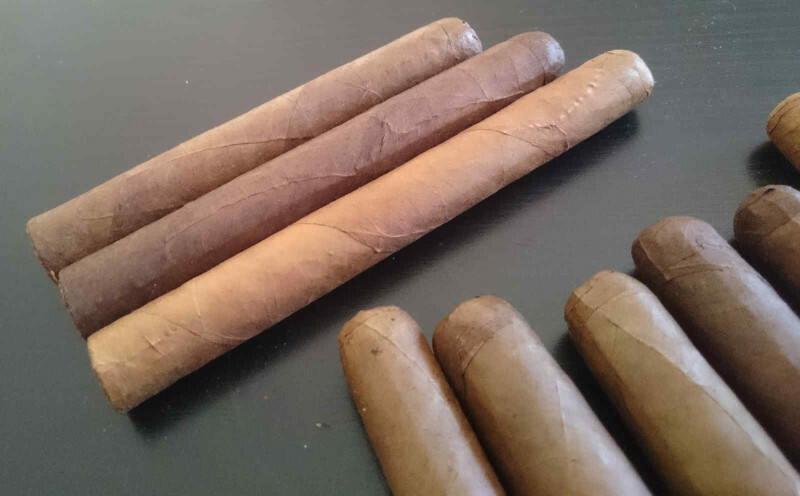 The Counsellor line is available at the moment in a San Andres wrapper, but will soon add a Connecticut wrapped version. I have not yet lit this one up, but look forward to it based on some of Terry’s other CT work I sampled back in January. I will report back via our forum once I’ve had the chance to give it a fair shake. Besides the Connecticut wrapper, it carries Connecticut Ecuador binder and all Dominican filler. All three blends contain most/all tobacco grown by TL Johnson & Co. The TLJ Legend Reserve contains one particular pilot varietal solely produced by TLJ. All of these should be shipping as we near the IPCPR tradeshow this July. I contend that 2016 could very well be a pivotal year in the development of Tabacalera TL Johnson. 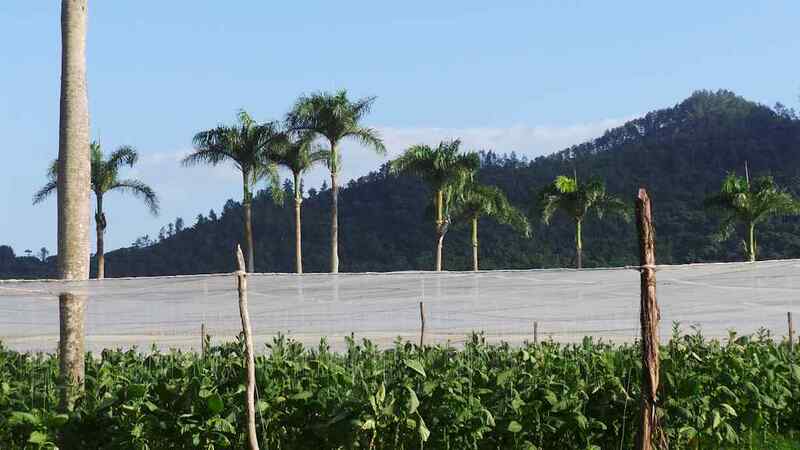 They have picked up production of several lines for a number of shop/house blends, as well as Tarazona and a couple other boutique companies. I believe some of the early groundwork and patience will pay off, and the foothold they have enjoyed in regional pockets will expand over the next 12 months. I’m looking forward to these and other upcoming projects Terry’s not yet willing to talk about publicly. If nothing else, I’m anxiously awaiting ready availability of the new TL Johnson Legend Reserve. These early samples are phenomenal…. 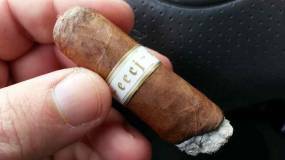 1 – Terry has appeared on our show as a guest (way back on Episode 021), but as you may know we don’t sell advertising on Half Ashed to avoid any real or perceived bias due to monetary factors…so while the opinions expressed here are personal to me, they’re based on my enjoyment of what I consider a good product. Almost a year-and-a-half in the making, our move to the Dominican Republic is finally upon us. Brain tumors and myriad other hurdles have been negotiated, our house has sold in record time and we are in the final throes of packing up our possessions. Our flight has been arranged and we’ll be departing on June 24th for Santiago. I am stoked to say the least. I’ve settled in this morning for wrapping up some final work issues and putting down some notes on this La Tradicion Cubana Reserva Familiar Maduro, which I should have reviewed months ago. I have to admit, its natural-wrapped brother set a high bar – but the maduro is really shining so far. It will be a tossup as to which I’d reach for first in the future. I suppose I’ll have to buy them in pairs :). Thankfully Luis Sanchez, the manufacturer, has his factory near where I’ll be living….Hopefully, I’ll figure out a good way to buy them once in-country. So…what cigar so accurately reflects your preferences that you’d pick up and move to another country to be near the factory? Not that this is what I’m doing…but I’m not saying it isn’t either :). I’m thoroughly enjoying Dion Giolito’s latest efforts. I fell in LOVE with the Fume D’Amour (see what I did there…). It may very well have supplanted the f9 as my favorite from the illusione stable. After only a few examples, the ECCJ 20th would be a toss-up for 2nd or 3rd on that list. In the end, I’d probably put it in 2nd if it were regular production; 3rd with it being limited. I’ve been a fan for several years, but have to admit illusione is really hitting a stride with my personal preferences in cigars these days. Kudos. These 8 Royal Palms at Chateau de la Fuente. Who knows the story? And where do you commonly see an image of them? They’re just better in Santiago…. My smoke o’ the evening with my cohort here in Santiago is a Fuente Casa Cuba. While I know it’s largely (or entirely) psychological, Dominican cigars just taste better in their native land. Call it mind tricks, silliness, or kismet….they’re just better. That’s my story and I’m sticking to it…..
First cigar finally going in Santiago! It’s a little later than expected, but I’m finally alight in Santiago. Sitting with good friends at my future home (Hoowahh! Can’t wait!) 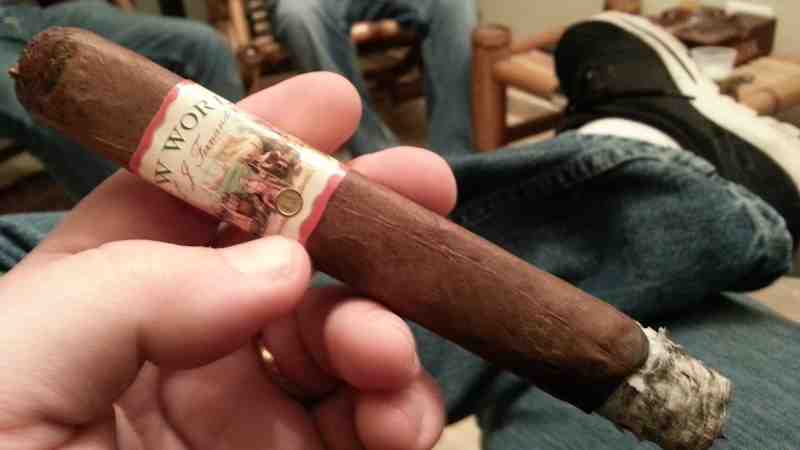 and a great cigar….Doesn’t get much better’n that! My wife is not a cigar smoker. She has had a few over the years, but one cigar every year or two doesn’t really qualify her as such. That being said, she does know what she likes – which is basically one of three different marques. She enjoys the Avo XO, Ashton Classic panatela or Fuente Between the Lines. Ever the encouraging husband, I typically keep one or two of each of those cigars around (except the Between the Lines.we have a number of those tucked away). 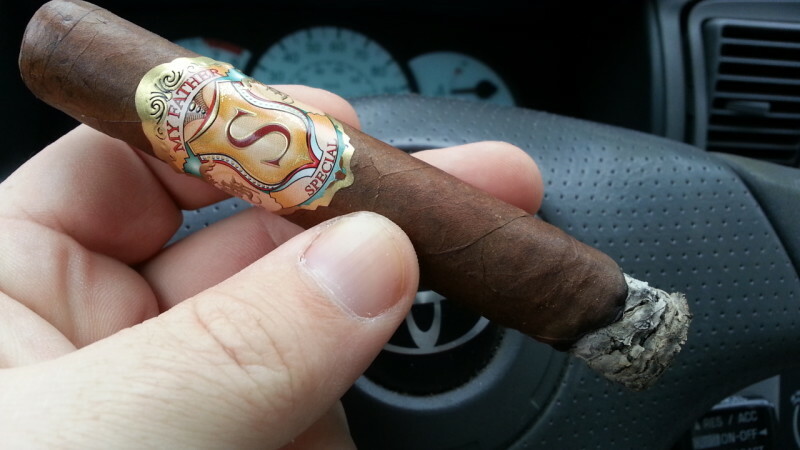 I was in an adventuresome (read:fickle) mood this morning, and went digging into the depths of the humidor looking for something that struck my fancy. I came across the Avo’s I’d put away for her..two little XO Intermezzos (5.5″x50). I figured “Hey.these things have been in here for years. It doesn’t appear she has designs on smoking them any time soon. I might as well fire one up.” So, I just moments ago sat down set it alight. I was never a huge Avo fan. Don’t get me wrong, I have enjoyed a number of the company’s offerings over the years; it’s just that there have never been any I felt compelled to stockpile deeply for the long haul. Just minutes into this little guy, I’m feeling a tinge of regret over that decision. 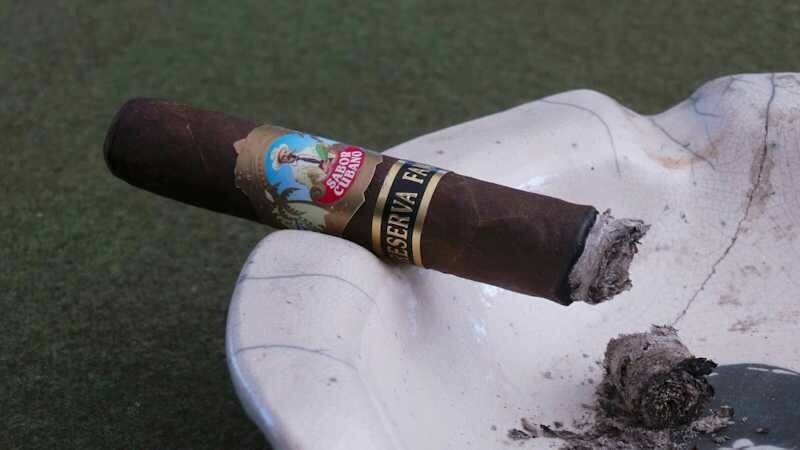 I don’t know if it’s a fluke, or if this line is prone to mature in the same way, but this cigar has developed a rich, clean – almost minty – flavor that is absolutely charming. It’s chocked full of savory, mouthwatering Sweet-Tart deliciousness. Even the cold draw before lighting was delightful. 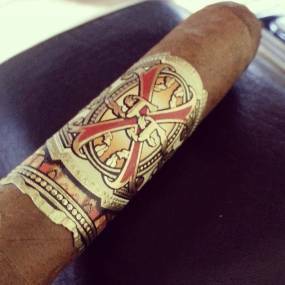 It’s been several years since I’ve smoked an XO, but I certainly don’t remember being so captivated by the blend at the time. Definitely not to this degree. I have one more with the same time under its belt in my humidor. If it’s as good as this one, I see a good chance of putting some away for a rainy day. I’ve asked recently about your favorites that might not be so well known to the rest of us.but what are some that may have national recognition, yet have fallen out of the public eye because they’re not the “latest, greatest blend”? Maybe there’s a cigar deep in your humidor just begging for you to take it out and enjoy the heck out of it “just because.” Something, perhaps, that you’ve even covered over with other cigars or forgotten about. Dig in there and find them..and let me know if you find any gems! What’s wrong with my @xikarinc Xi1? First off.this is absolutely NOT a dig on Xikar. I’m a huge fan and have been for many years. I own no fewer than a dozen pieces of their product, and believe they produce a quality product. This is merely an honest request to see if someone has a solution for this. 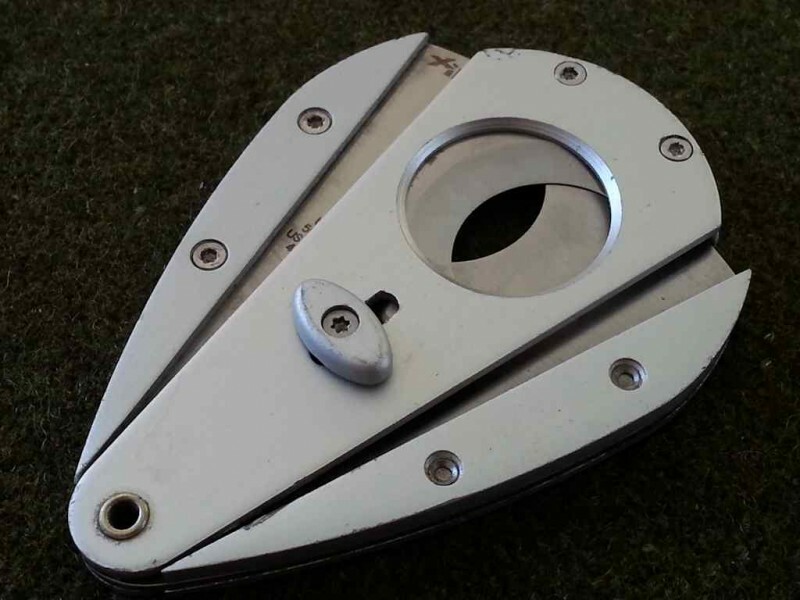 The Xi1 pictured above is one of my favorite cutters. It’s been a trusty companion for an unfathomable number of gatherings, clipping hundreds – if not a couple thousand – of mine and any cutterless cohorts’ cigars. But, in recent months it has begun to stick. Badly. The picture shows what happens when I press the button down these days. It simply won’t open without several gyrations and attempts at prying it open to make the cut. This wouldn’t be a huge issue, except it also sticks when actually making the cut.which often tears or dings the head of the cigar producing a poor cut. A quick Google search produced advice that it was merely getting sticky from bits of tobacco leaf, oils or other detritus. The solution is a quick soak and/or scrub with rubbing alcohol. I’ve soaked. I’ve scrubbed. I’ve removed the button and really gone to town with an alcohol-drenched Q-Tip in ever nook, cranny and crevice. It’s about as clean as a lay person can get it. Something is still “catching” every time. I know – Xikar has a great warranty. I could send it back and they’d likely repair/replace it without even question. I’ve done such before with lighters. However, I am trying to avoid that if there’s another good solution I could just do myself and save the time and trouble of shipping, etc. Yes, I have other cutters that would suitably stand in during transit. I get it. I’m just “that guy.” If there’s a quicker way, I’m up for it.